EconomicsIs Bitcoin's rise driven by Russian pyramid schemer Sergey Mavrodi moving into China? Bitcoin’s price jumped this week, but mostly in China. Is a notorious MMM pyramid schemer Sergey Mavrodi responsible? He wouldn't be the first hustler to get in on the market. Bitcoin’s price has jumped to $500 earlier this week before crashing 20% to around $400 after spending months in the $200s. This price surge is coming out of China with most of the trade volume on Chinese exchanges, after a wave of positive testimonials posted on Chinese video sites for “social financial network” MMM run by notorious Russian conman Sergey Mavrodi. 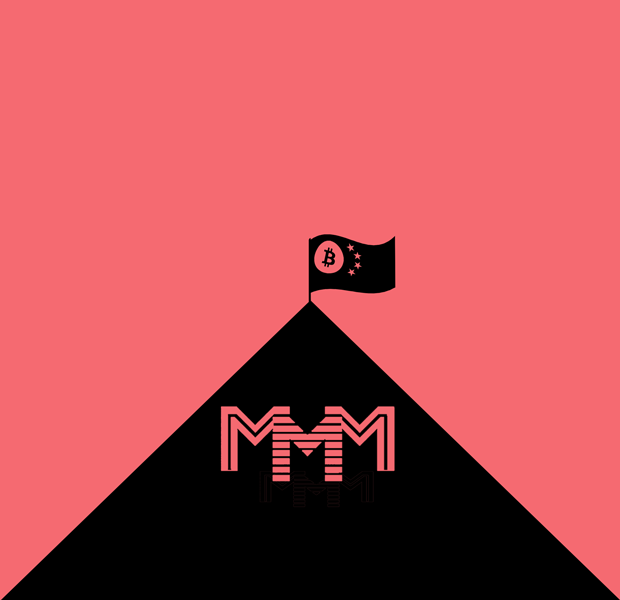 MMM was founded by Mavrodi in the new post-Soviet Russia. In the early 1990s, Russians were bombarded with adverts showing working-class families becoming rich by investing in MMM. Millions of Russians gave their money to Mavrodi and using his success, he was elected to parliament to get special immunity. In 1994, the scheme collapsed, bankrupting thousands, and Mavrodi served 4½ years in prison for fraud, but only after they revoked his parliamentary immunity. ↑ The MMM commercials, which have become sad cult classics, often involved the punchline of "They didn't con me!" as spoken by a particularly relatable character such as a vulnerable auntie or a skeptical grandmother. Amazingly, after getting out of prison, he launched new pyramid schemes. His latest version, MMM Global, is designed to exploit holes in weak financial regimes. On his blog he called them: "This is a pyramid, it is a naked scheme, nothing more ... People interact with each other and give each other money. For no reason!" Instead of acting as a company, MMM now presents itself as a “mutual assistance network” that only exists online, where people buy and share Bitcoin with a pseudo-Marxist ideology that Mavrodi peddles. Not everyone is excited for MMM. The largest Bitcoin exchange in the world, OKCoin, currently under cyber attack, has declared “neutrality”, distanced itself from MMM, and warned its investors to avoid “multi-level marketing ponzi schemes”. Bitcoin’s legally vague status helps. The People’s Bank of China forbids financial companies from working with Bitcoins, but not individual people. Without a centralized institution, no way to reverse Bitcoin transactions, and no Bitcoin insurance available, investors are helpless. And if the scheme collapses, Mavrodi will just launch a new one. 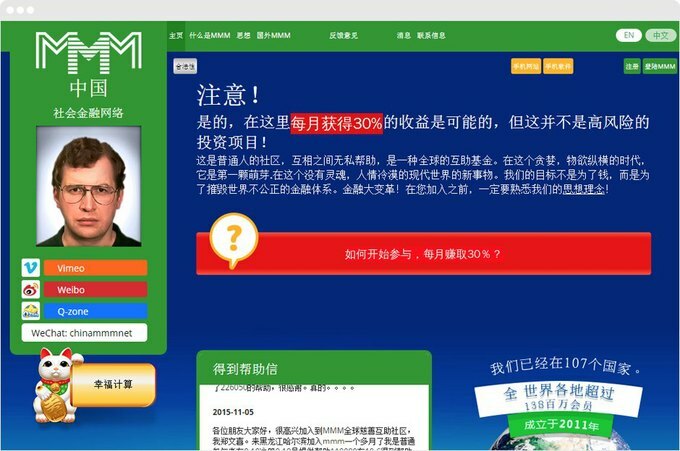 MMM claims to operate in 60 countries, and as Mavrodi’s decades-long career proves, there’s a sucker born every minute. Bitcoin released by anonymous programmer using the pseudonym Satoshi Nakamoto. Bitscalper was set up as an “arbitrage engine” promising very high returns. Shut down suddenly. Texan Trendon Shavers, 33, aka “pirateat40” arrested by the SEC for running a Ponzi scheme. Pleads guilty to fraud, sentencing pending. FBI arrested Ross Ulbricht, 31, aka “Dread Pirate Roberts” and seizes huge Bitcoin holdings. Ulbricht is ultimately sentenced to life in prison without parole. GBL was advertised as a Hong Kong-based exchange attracting a lot of attention in the Chinese market, operators suddenly shut the company down and fled with the money. 3 were arrested in China for their part in the scam. The Czech owner of darknet drug market Sheep Marketplace, Thomas Jiřikovský, commits an exit scam, simultaneously closing the market and stealing all the users’ funds in the biggest Darknet theft. Czech authorities arrest Jiřikovský after noting suspicious bank activity. After months of frozen customer funds, the Mt. Gox Bitcoin exchange, formerly a website to sell Magic: The Gathering Online trading cards as “Magic: The Gathering Online eXchange” and the largest Bitcoin exchange goes bankrupt. Former CEO Mark Karpelès, wanted in France for fraud, was arrested in Aug 2015 for fraud and embezzlement. Blake Benthall, 27, aka “Defcon”, the administrator is arrested by the FBI and an unknown amount of Bitcoin is seized. Pseudonymous administrators “Kimble” and “Verto” of darknet market Evolution, which sold everything from hard drugs to stolen credit cards, executed a classic “exit scam”, taking all user funds. BlankBank, the 2nd largest darknet marketplace at the time, has all of its funds drained and laundered through a Bitcoin tumbling service that they installed back in May. In June it was revealed that DEA agent Carl Mark Force IV, 46, extorted Ulbricht of the first SIlk Road darknet market for tens of thousands of Bitcoins. He is eventually sentenced to 6.5 years in prison.